completly agree, one of the most satisfying death scenes ever... all through the film, your like 'what an epic douche... i hope something bad happens to him...' wait for 2 hours (extended editions) gets set on fire and jumps to death! wo! If there was a winner it has to be Alan Rickman as the Sheriff of Nottingham in Robin Hood: Prince of Thieves. Can't find a video of it anywhere but we all know Rickman is why that film is worth watching. Everyone remembers Roy's death, but Zhora's definitely hit me harder the first time I saw Blade Runner. It's poetic, tragic cinema at it's best. Boromir's death always makes me shed a tear. Ellie's death in Up just makes me bawl. The music is what really makes this scene so powerful. How come no one mentioned the scene where Mr Brooks is stabbed in the neck with a pair of scissors by his own daughter? That scene was insanely real! 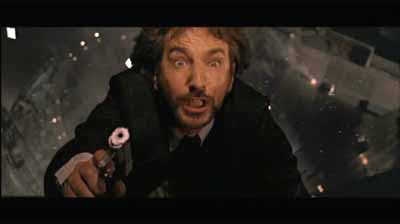 Although I admire John McClane's bravery and courage in confronting such hostiles, I believe Hans Gruber's death was entirely preventable, it is thus of my opinion that one Hercule Poirot should investigate the circumstances surrounding said death. Hans was worth move alive, as we now know. What the crappy Final Destination films wish they could emulate well. when nemo's mum is killed, i want to shoot myself. When Denzel Washington gets shot at the end of Malcolm X. Such a moving and emotionally charged scene. You can almost feel what it was like in the Audubon Ballroom that fateful evening when Malcolm X was shot. This one is definitely the best for me. It's from the movie called "Trade". It's a movie about human trafficking. The girl from the video tried to escape from this trafficker so he wants to learn her... You'll see the rest yourself. And I really recommend this movie! Btw, listen to the music! It's really touching, suits this episode so well! Dobby, though that's mainly the memory of the book. That scene in one of the first series of Spooks where they torture a woman by shoving her hand in the deep fat fryer, which was disturbing enough, then they submerge her head and drown her in it. Obscenely traumatising. It's an anime and not a film but meh. If you haven't seen Code Geass and don't plan to I'll just explain the story. The main guy guy is an exiled prince of an Empire, gets a power (typical anime) and seeks revenge and to find out about his mothers death. Uses said bother to form a rebellion with an alter ego, "Zero". He tries to change the world for his sister who was disabled and made blind by their father. Lots of fights with big robots. At the end, his rebellion find out about his past and how he was a prince of the enemy and his identity. He kills his father, the Emperor and rules as a Tyrant so that he becomes the world's enemy. He gets his best friend who is also trying to change the world from within the Empire, to disguise himself as "Zero" and kill him so that all the world's hate dies with him leaving a better world for his sister and his friends who had thought he was an evil Tyrant but realise he was saving them all. Guido in Life is Beautiful! It is probably not the best death scene ever, I admit, but the fact that, even in the face of death, his only concern is making sure he does not upset his son is soo sad ! Don't watch this if you don't want to find out the end of Being Human series 3, but this one definitely has to be in there. I was gutted. Most tragic bromance ever or what? Age limit to be gay? Your most upsetting TV show? What's the saddest film you've ever seen? - Make me cry! Top 3 characters from "the Wire"?